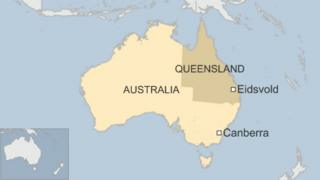 Rare earthquakes have hit Queensland, Australia, with tremors reported hundreds of kilometres away. Meteorologists said a 5.2-magnitude tremor occurred near the town of Eidsvold in the early hours of Monday. A second - weaker - earthquake struck about an hour later, with local residents in the nearby town of Mount Perry reporting power cuts. There were no reports of injuries. The last notable earthquake in Queensland was recorded in 2011. Fire services received a number of calls from local residents worried about a possible explosion in the area, a local spokeswoman was quoted as saying by Australian media. Geoscience Australia said the earthquake was at a depth of 17km (11 miles).